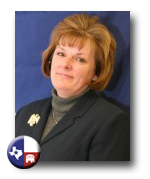 Tarrant County GOP Chair and fellow TexasGOPVote contributor Stephanie Klick announced on Tuesday she is seeking the party's nomination for the 101st Texas House District. The newly drawn district includes the cities of Azle, Blue Mound, Ft. Worth, Haltom City, Kaslet, Keller, Pelican Bay and Saginaw. Because of the re-drawn district, there is no incumbent in the race. During her eleven years as either Vice Chair or Chair of Tarrant County GOP, Klick has developed a team that has made Tarrant County one of the most Republican counties in the country. Having worked her way up from a precinct chair in the Azale area, Klick has modernized how GOP politics are conducted. While discussing the race with her on Tuesday, Klick told me, "I am running on a platform of constitutionally limited government, fiscal responsibility, free enterprise and freedom. Citizens in District 101 can count on me to champion these conservative values in Austin. " Earlier this year, Klick was a featured "Voice of the Conservative Vote" on TexasGOPVote where she said, "Winning politically starts at the precinct level. The skills, tools and strategies for organizing a precinct are necessary for success whether running for precinct chair or for President of the U.S." Now she will have the opportunity to put that principle to the test. Tarrant County GOP Chair Stephanie Klick introduces Governor Rick Perry during his re-election campaign in 2010. Stephanie Klick has been teaching "Politics 101" for many years in Tarrant County and across Texas. Now it is time for her to be State Representative 101 (House District 101, that is...) And with that, her hat is now in the ring!